The windows around your property do a lot more work for you than you might think. Keeping an inviting property is a nearly full-time job, so why let something as simple as dirty windows destroy all of your hard work? 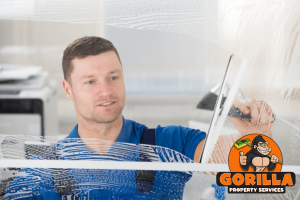 Instead of dealing with streaks, stains and damage, let our Gorillas keep your windows brighting and sparkling with our Acton window cleaning. Glass that makes up the windows and doors around your property is a porous material. It might feel sturdy but it is made up of microscopic pores. As dirt, debris, dust and stains sit against surfaces, they creep into these pores and degrade glass from the inside. As glass becomes weakened, it is subject to breakage – particular as weather begins to change. In Canada’s unpredictable climate, the cold comes in and can crack windows for no apparent reason. What could be worse than a cracked window in frigid temperatures? Instead of simply blocking out natural light, degrading windows can affect your heating bills as well as leading to cracks and the need for replacements. In order to prevent any of these unfortunate events, make an Acton window cleaning a part of your maintenance routine. In order to get the best results for your Acton window cleaning, our Gorillas assess before we act. Older windows should be treated differently than new ones and higher level windows require a bit more finesse than those on the ground floor. When they are within reach, windows are treated with eco-friendly cleansers and rubber squeegees. By using rubber tools instead of the typical paper towels and blue spray, our Gorillas beat back static. The friction that amounts from wiping the surface of glass creates a static charge, which attracts new materials. This leaves windows looking filthy right after you clean them! 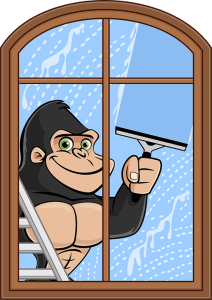 Let our Gorillas handle the hassle by outsourcing your Acton window cleaning! For those hard to reach windows four storeys and under, our Gorillas have a system! Each and every Gorilla-Mobile vehicle is equipped with an independent mobile water source, and Tucker Poles. Tucker Poles are water-fed and allow our Gorillas to reach previously unreachable heights. Our Acton window cleaning offers not only clean along the surface of your glass but your sills and frames as well.